Thus far, I’ve just been posting photos for the Black History Month Photo Challenge, but I’d like to offer a word or several about the book I’ve chosen for today’s challenge. As a really young adult, Alice Walker was the Black woman writer that I read more than anyone else. This may have been at the height of her writing career, I really don’t remember, but all I know is that I devoured pretty much everything she wrote. 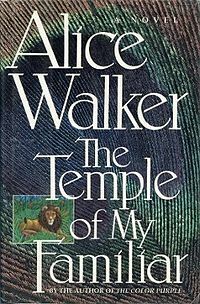 I remember finishing The Temple of My Familiar for the first time ( I was 19 or 20) and wondering what the heck I had just read. I didn’t “get” it. And this time, when I finished the novel, I knew that I had been changed forever. I cried at the end, because I knew that Lissie and Hal would be together forever, regardless of the form their bodies would take. That love could transcend our earthly bodies and had the power to change lives, although that might sometimes mean leaving your lover. That we are intimately connected to our ancestors, animal and human. Every time I read the book I cried at the end, and looking at the cover for the book this morning brought tears to my eyes. The image of that little red slipper on the lion’s foot just does it every time. I love this book so much that for the next several years, I read it again at least once a year. I also knew after reading this book that I would write about Black women’s writing for the rest of my life. It took me a few years to do it consistently, but now I can truly say that my life’s work revolves around reading and writing about Black women’s literature, and even writing a little bit of my own. Although I haven’t read a new novel by Alice Walker in a few years, I credit her with introducing me to the myriad ways that we can experience life and love on this earth, and the ways in which words have the power to impact our lives. She is a master storyteller, and although it was very difficult for me to choose one book to celebrate today, I chose The Temple of My Familiar because more than anything, it is love. So, after our usual morning chat, T. asks me what my intentions are for the rest of the day. I tell her about the tons of grading I need to do, the laundry, packing for my upcoming trip, conference stuff I need to get started on, yada yada yada. She then asks me: When are you going to do YOUR work? Meaning of course, the diss. Welp!! Right after I post this blog. I’ll see y’all later in the week. I’ve got some writing to do!